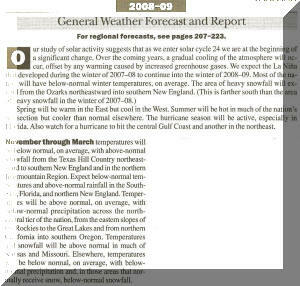 This study found that the OFA national regional forecasts for Winter 2008-2009 (Nov. - Mar.) received only a cumulative grade of D. The overall regional grades, based on the monthly analysis for the month of November through March, were only slightly better, ranging from a D- for the Southeast to a C+ in the High Plains. 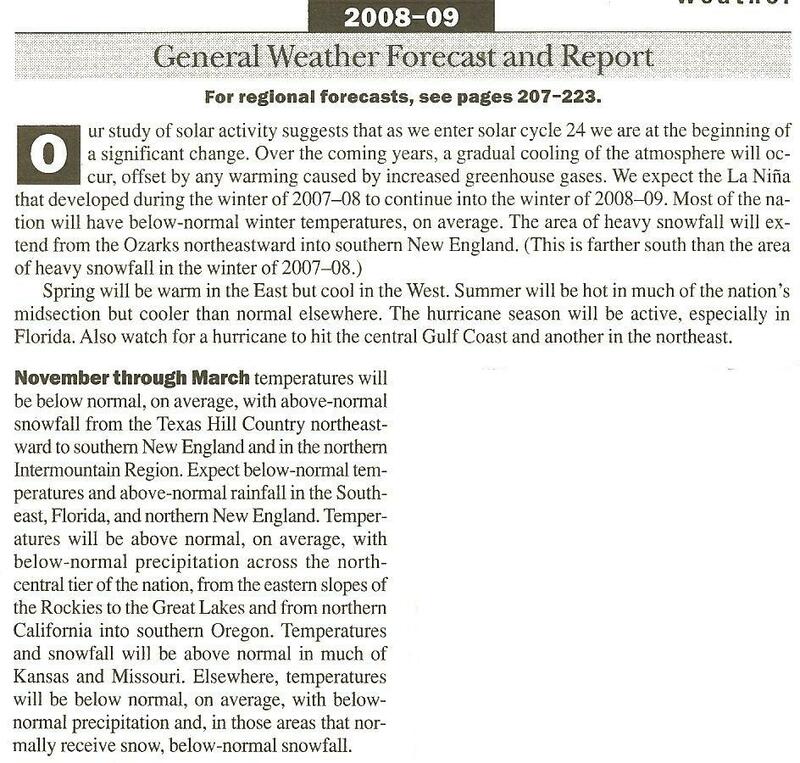 Last November's 2009 edition of the Old Farmer's Almanac (Yankee Publishing, Dublin NH, 2006) was examined. 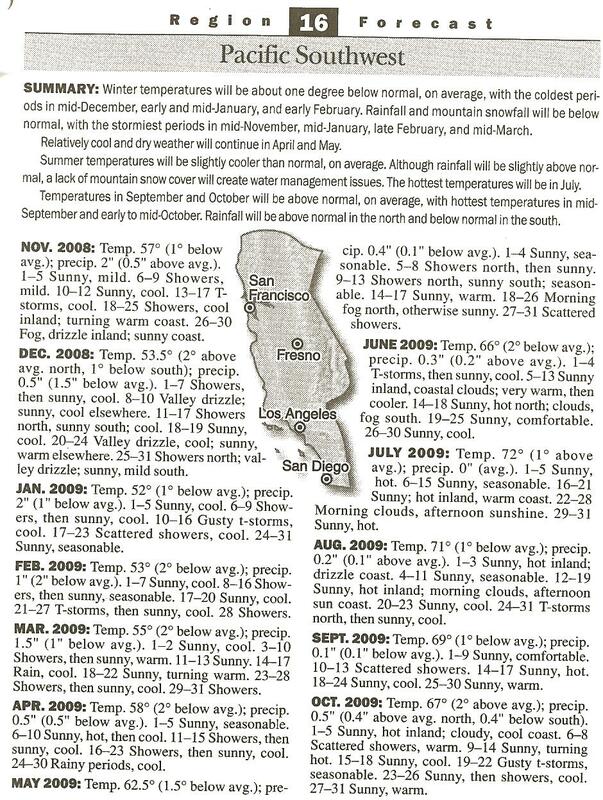 There was a seasonal weather graphic for the winter season (Fig. 1) as well as a textual forecast (Fig. 2). 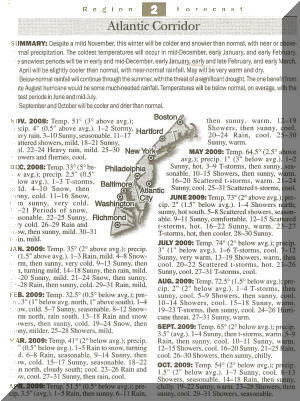 The weather forecast section of the Almanac is also divided into 16 geographical regions. Text forecasts for five regions (Atlantic Corridor, Southeast, Lower Lakes, High Plains and Pacific Southwest) were chosen to evaluate as geographically diverse as well as encompassing most of the major metropolitan areas (Fig. 3-7). To evaluate the OFA monthly regional forecasts each monthly forecast was compared to the actual monthly temperature and precipitation anomalies by climate division. Data for climate divisions was chosen because of the large number of sites that are used in determining the division average, thus eliminating the bias of a single station. 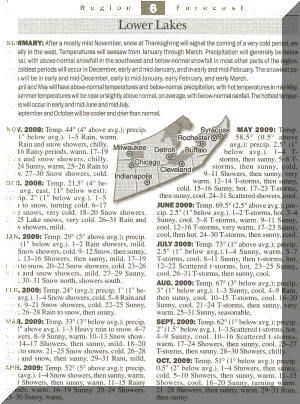 Precipitation and temperatures were evaluated for the winter months of December through March. A - Both the sign of the anomaly and the magnitude were correct. B - The sign of the anomaly was correct, but the magnitude was wrong. 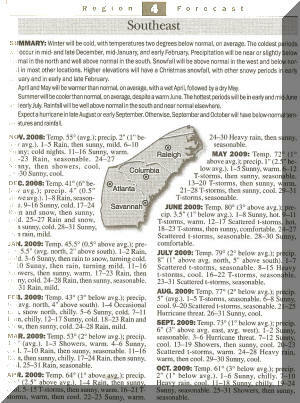 C - Wide variance within the forecast area with a portion correct and a portion incorrect. D - The sign of the anomaly in wrong, but the magnitude is basically correct. F - Both the sign and magnitude were incorrect. 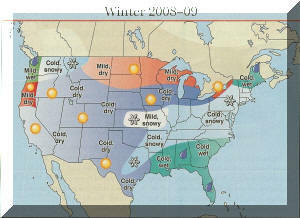 The analysis of the Winter forecast showed that the character of the winter was missed across most of the nation. 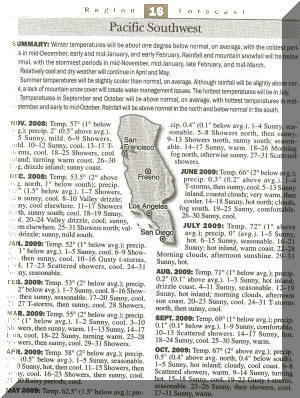 The introductory paragraph of forecast text (Fig. 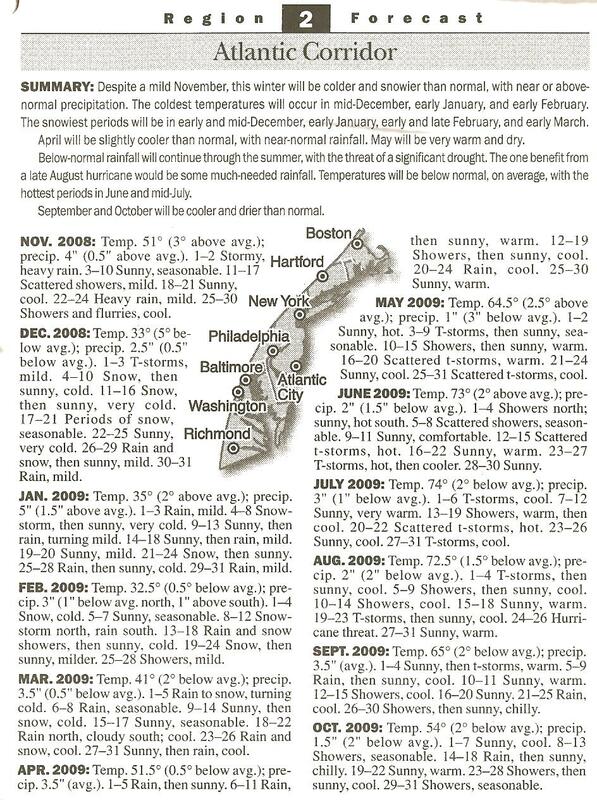 2) highlighted 1) "Most of the nation will have below normal winter temperatures" and 2) "the area of heavy snowfall will extend from the Ozarks northeastward into southern New England". From the Nov. to Mar. 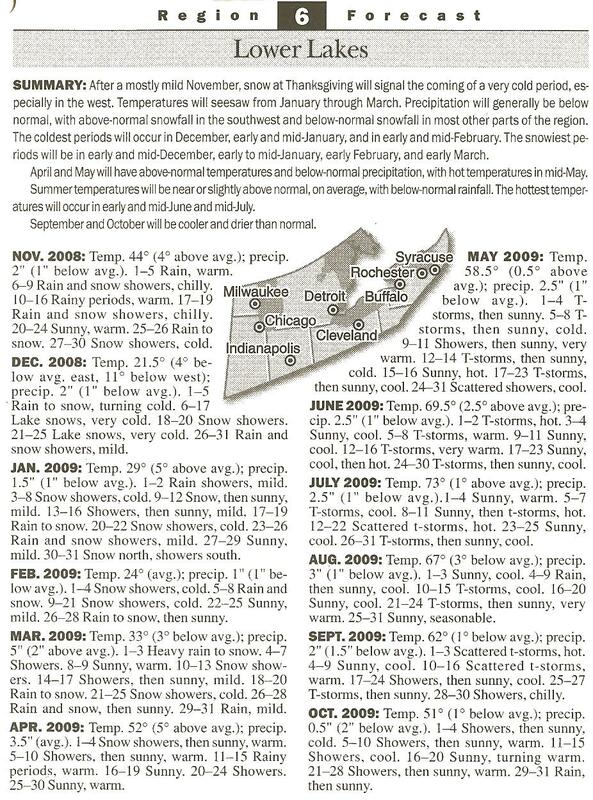 temperature anomalies (Fig. 8) most of the nation was normal to above normal. And from the precipitation anomalies (Fig. 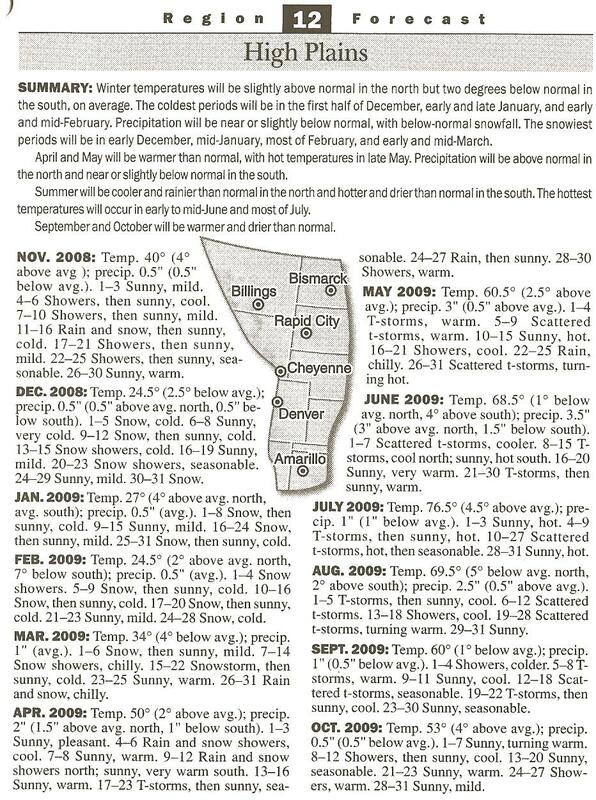 9) the region from the Ozarks to New England had well below normal precipitation. The graded winter forecast (fig. 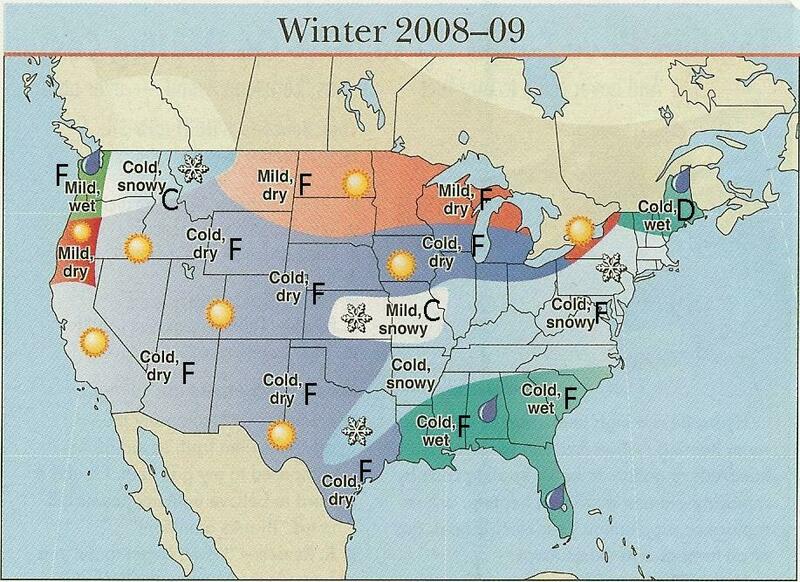 20) is based on the OFA Winter Forecast Graphic (Fig. 1) compared to the winter season temperature and precipitation anomalies (Fig. 8-9). The Graded Monthly Regional Forecasts are based on a comparison of the OFA regional forecasts (Fig. 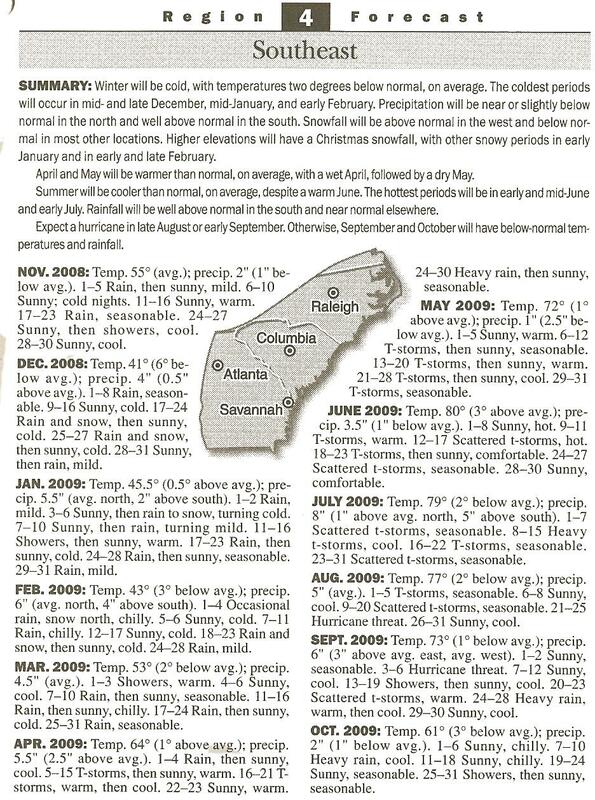 3-7) and the monthly temperature and precipitation anomalies (Fig. 10-19). Grades were assigned based on the criteria above. 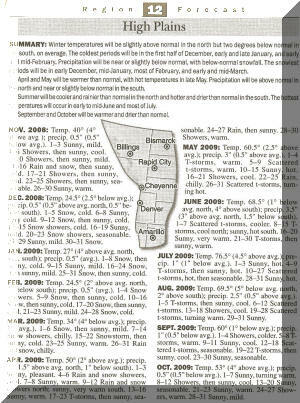 The best forecasts were for the High Plains for November 2008 with both the temperature and precipitation forecasts correct. However, the rest of the season for that region had a very poor showing for the temperature forecasts. The worst forecasts were in the Atlantic Corridor for December and January with poor forecasts for both precipitation and temperature. The overall grades by region (Fig. 21) showed the Atlantic Corridor, Southeast and Lower Lakes all getting a grade of "D", while the High Plains and Pacific Southwest received slightly better overall grades of "C". The total grade distribution for all the regions showed a total of 11 A's, 6 B's, 6 C's, 3 D's and an astounding 23 F's!